Haitian Voodoo is mostly derived from a religious system of deity and ancestor veneration widely practiced in western Africa at the time of the Atlantic slave trade. Haitian Voodoo has extra ("New World") spirits which do not exist in African voodoo. People who ended up as slaves on the caribbean islands controlled by the Kingdom of France were forbidden (at first on an ad-hoc basis, later by the Code Noir) from practicing any religion other than Catholicism. In light of all this a process of syncretisation took place on Haiti (or Saint-Domingue as the territory was then called) where some voodoo loa (spirits) became identified with Catholic saints and some Catholic saints became loa in their own right. It's a fascinating subject, an introduction to which should be related by those more talented than I. BoB particularly reccommends Webster University professor Bob Corbett's site in this regard. A particular syncretisation spurred me into writing about Voodoo - that between the Black Madonna of Czestochowa (Polish: Czarna Madonna Częstochowska) and the New World loa Erzulie Dantor. This is the loa of single mothers, homosexuals, justice and independence. Dantor was present at a famous voodoo ritual in 1791, where she took over the body of one of the worshippers and urged Haitians to "kill the stranger" - this precipitated the revolution which culminated in independence for the island in 1804 and the massacre of every Frenchman on the island. For her part the Black Madonna has a special place in Polish national myth. The painting is housed in Poland's holiest monastery at Jasna Góra. Legend has it that the icon was painted by St. Luke on a tabletop belonging to Mary and Joseph and eventually brought to Poland. Her distinctive facial scars are said to have miraculously reappeared after they had been painted over following a pagan attack, an indication that the Black Madonna wanted to share in the nation's fate. Revolutionary Haitians were not to know all of these details. The backstory to the painting in Voodoo lore is of a mother fiercely protective of the daughter she carries (actually Jesus in the Catholic interpretation). She loves knives and received the facial scars fighting with her sister Erzulie Freda. The scars are a sign of Dantor's strength - she is wounded but keeps going. It is hard to say why this particular religious painting became a popular focus for syncretisation with a "New World" spirit of Haitian Voodoo. Her black skin may have made the painting more acceptable to a black population than other white-skinned versions, much as images of saints with explicitly Black African features are popular in Africa. It is also possible that there were many more copies of this particular painting on the island than others, following the landing of 5000 Polish legionaries on the island in 1802. 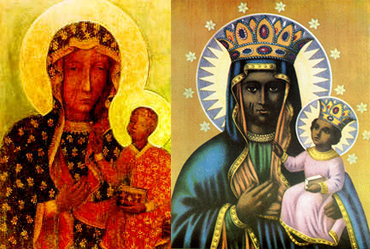 Many Poles to this day keep depictions of the Black Madonna in their homes, cars and wallets. Definitely enjoying the blog. Motivation to resurrect mine! There were lots of Poles in the forces during the wars of independence in Haiti, many of whom apparently switched sides. I imagine they brought her with them. Polish sur names can still be found in Haiti to this day. I always check your blog, is great. Just do it,you can make it. I would appreciate the history engraved in my career but I do not want to be a teacher by any means. Some ideas for career choice are appreciated.